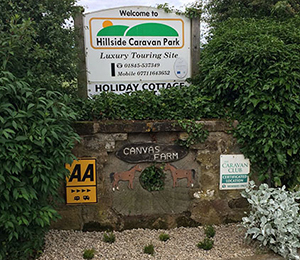 When leaving Knayton Village DO NOT turn off the road until you reach entrance to Hillside Caravan Park, 1½ miles. Turn left off A19 Dual Carriageway signposted "Knayton". In ¼ mile turn right (crossing bridge over A19) through village. The site is on left in approximately1½ miles. Turn left off A19 Dual Carriageway signposted "Knayton". Turn right and proceed through village. The site is on left in approximately 1½ miles.